Own all three lesson tiers of the Polgar Chess University for one low, amazing price! For a limited time, you can own all three complete levels with our lowest price ever! 2) Once in the cart, you will be presented with a link to claim this package for free. The Polgar Chess University Beginner Mega Bundle is an incredible collection of 318 lessons (over 135 hours!) from one of the most famous chess coaches in the world, Susan Polgar! Polgar Chess University caters to students of all levels, and regardless of location, you have an opportunity to learn chess from one of the best instructors in the game. 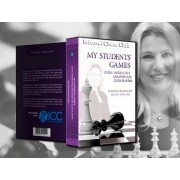 GM Susan Polgar, former Women's World Chess Champion, created this complete course with the dream of bringing expert advice and training to chess enthusiasts around the world at a very affordable cost. Susan is one of the most famous chess coaches in the world. A former child prodigy, Susan now coaches some of the most promising players in the US and has top 10 player Wesley So as a famous former pupil. The first female player to achieve the full Grandmaster title and sister of the strongest woman player of all-time, Judit Polgar, Susan’s expertise in chess and coaching is beyond doubt. Course lessons are prerecorded lectures that may be viewed at your convenience. Your purchased videos are always available in your "My Downloadable Products" section. Courses can be imported into iTunes an sync'd on all your iDevices. Having been playing on and off for over 50 years I wondered whether to bother watching the beginners, it is well worth the trouble, so far I am very impressed. Not yet finished the first of three sections. Treated myself to an Xmas present. A great course on all aspects of the game. In my opinion, it allows reaching another level of understanding of chess for any player. GM Susan Polgar teaches the game with passion and is particularly clear in her explanations. The puzzles are very interesting as well.